Alright, Dean Winchester, listen up. I’m making pie. Place flour in a mixing bowl and “cut in”* shortening until the mixture reaches a corn meal consistency (a little chunkier is okay too). I used a pastry cutter, but I have been reliably informed that you can use a knife and fork to achieve this. Add salt, vinegar, egg and water (one tablespoon of water at a time. I usually only end up using 5 Tablespoons) and mix until everything is well combined and it looks like pie crust dough. Split the dough in half and form each half into a ball. On a well floured work surface, roll the dough into a piece big enough to cover the bottom of your pie pan with a little overlapping the edge. (My pie pans are extra deep, so my dough is sometimes a bit thinner when rolled out). Gently move into the pie dish. Don’t worry if it tears a little. This happens to everyone, and no one sees the bottom of the pie anyway. Just use your fingers to press the torn edges together. Disclosures: Okay, fair warning. I mentioned this recipe needed a bit of tweaking to perfect. I’ve tried this with both cornstarch and flour as a thickening agent, and both times it ended up a little runnier than I’d like. The taste, however, is divine. I’m thinking I use a bit too much lemon juice in combination with the vanilla. (I don’t actually measure the lemon juice). Also, I mentioned my pie pans are extra deep, so you may not need as many apples. Heat oven to 375 F. As you peel, core and slice your apples into a mixing bowl, be sure to sprinkle them with lemon juice. This will keep them from turning brown while you work. When all your apples are ready to go, add the vanilla. Toss until all the apples are well coated. There shouldn’t be extra liquid in the bottom of the bowl. If there is, I recommend you drain it off. In a separate bowl, combine granulated sugar, brown sugar, cinnamon, nutmeg, ginger, and cornstarch, and whisk to combine. Add the mixture to the apples and mix well with a large spoon until all the apple pieces are coated with the mixture. Pour the apples over your bottom crust in the pie plate. Cut up the butter into little chunks. I usually quarter the tablespoons I cut from the stick of butter. Dot the pie filling with butter (it adds a nice richness to the filling, but if you forget, it isn’t a problem). If you haven’t already, roll out your top crust to the same thickness of the bottom crust (kind of close anyway. You don’t want it to be too unbalanced). Carefully transfer the top crust to cover the apples in the pie plate. Make sure you have enough to overlap the edges of the pan a bit (although this isn’t strictly necessary, I found it helps me to make a prettier pie). If your crust tears, just gently press the torn edges together with your fingers. Trim off the excess crust with a small, sharp knife. My pie plates have a pretty wide lip, so I use that as my measurement on where to trim. It is about 3/4 of an inch wide, and I find that is just enough to make a pretty edge. Press the top and bottom crust together with your fingers, and turn up a little bit. Then, using your fingers, scallop the edge of the crust. ** (Really I should have taken pictures to show you, but I was too excited about eating pie.) Finally, using a sharp knife, cut a pretty design in the top crust to allow steam to vent during cooking. Cover the edges of the crust with foil to prevent burning. Bake for 20-30 minutes, checking occasionally, until the crust is golden brown. (If it takes a little longer, don’t worry about it. I start checking at 10 minutes in, because I’ve owned ovens with a…unique sense of temperature.) Once golden deliciousness is achieved, and your whole house smells like heaven, remove the pie from the oven and let cool. I know we like warm pie, but that filling is hot don’t eat it too quickly and burn yourself! * To “cut in” the shortening to the flour using a fork and knife, just act like you’re cutting up dinner. You’re just looking to achieve much smaller pieces than bite sized, and it takes a little while, so don’t get frustrated. 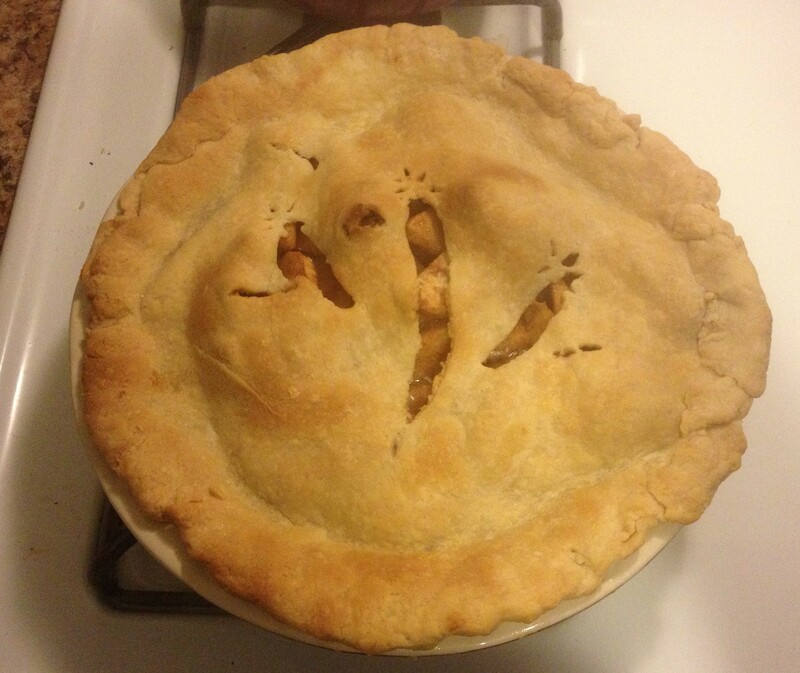 This entry was posted on Tuesday, July 15th, 2014 at 2:37 pm	and tagged with Apple Pie, Apple Pie Filling, Baking, Pie Crust, Tasty Goodness and posted in Entertaining, Food. You can follow any responses to this entry through the RSS 2.0 feed.